The call for nominations for the 4th Polymer International–IUPAC Award for Creativity in Applied Polymer Science or Polymer Technology is now open. The deadline for entries is 31 October 2013. Readers of CI are encouraged to recognize the achievements of their colleagues by nominating them for this award, which includes a cash prize of USD 5000. The award will be presented at the IUPAC World Polymer Congress–MACRO 2014, 6–11 July 2014 in Chiang Mai, Thailand. The winner will be awarded USD 5000 plus travel and hotel accommodation expenses to attend MACRO 2014, where he/she will present an award lecture. The winner will be selected by the Scientific Committee, representing Polymer International and the IUPAC Polymer Division. Nominees must be under age 40 on 31 December 2014 and must be available to present an award lecture at MACRO 2014. Please see website for specific details regarding the nomination process. 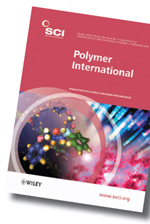 The Polymer International–IUPAC Award was awarded to Zhenan Bao in 2008, Molly Stevens in 2010, and Ali Khademhosseini in 2012.